Copyright � Bradbury,RS et al 2011. This work is distributed under the Creative Commons XXXXXXX XXXX License. Background: The influenza A/H1N1/09 pandemic spread quickly during the Southern Hemisphere winter in 2009 and reached epidemic proportions within weeks of the official WHO alert. Vulnerable population groups included indigenous Australians and remote northern population centres visited by international travellers. At the height of the Australian epidemic a large number of troops converged on a training area in northern Australia for an international exercise, raising concerns about their potential exposure to the emerging influenza threat before, during and immediately after their arrival in the area. Influenza A/H1N1/09 became the dominant seasonal variant and returned to Australia during the Southern winter the following year. 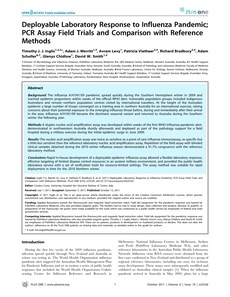 Methods: A duplex nucleic acid amplification assay was developed within weeks of the first WHO influenza pandemic alert, demonstrated in northwestern Australia shortly afterwards and deployed as part of the pathology support for a field hospital during a military exercise during the initial epidemic surge in June 2009. Results: The nucleic acid amplification assay was twice as sensitive as a point of care influenza immunoassay, as specific but a little less sensitive than the reference laboratory nucleic acid amplification assay. Repetition of the field assay with blinded clinical samples obtained during the 2010 winter influenza season demonstrated a 91.7% congruence with the reference laboratory method. Conclusions: Rapid in-house development of a deployable epidemic influenza assay allowed a flexible laboratory response, effective targeting of limited disease control resources in an austere military environment, and provided the public health laboratory service with a set of verification tools for resource-limited settings. The assay method was suitable for rapid deployment in time for the 2010 Northern winter.